Be part of the encore: A Christmas Holiday Spectacular, Thanksgiving 2020 with Dr. John Leavitt, composer, conductor, arranger. 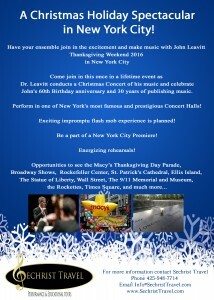 Be a part of the New York Holiday Festival Choir for this exciting event. With successful events in 2016 & 2018 we’re doing it again next year. 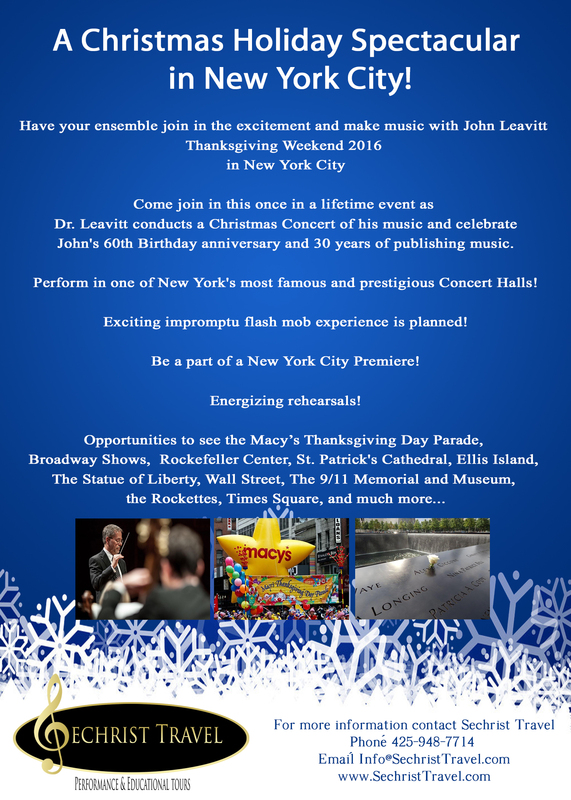 Dr. Leavitt will be conducting a thrilling program of his best holiday music in New York. The venue will be in the famous Carnegie Hall. Sean Berg with Sechrist Travel will be providing the package for participants interested in joining. Sean has produced concerts in New York, Washington DC, and Chicago for John for nearly 20 years. John says “Sean is a choral musician himself and is sensitive to making these opportunities a great experience for all of his clients.